If you’ve never made protein fluff, I’d like you to stop what you’re doing, get out your calendar, journal, or whatever it is that you use to jot down your daily/weekly to do lists and pick a day where you write down “make protein fluff.” I’m being serious, do it. Do it because protein fluff will ASTOUND you. Look, do you know Steve Cook? The US bodybuilder, fitness model, creator of stevecookhealth.com and fellow columnist at bodybuilding.com? Steve hadn’t tried protein fluff before we met. This is him eating protein fluff for the first time. Notice the look of amazement? Yeah. This is common. OK. Now look at these people’s faces. They’re Zoe Smith – olympic weightlighter and all-around superhero, Fabio Bonanno, and Susie Woffenden trying Ben Tormey‘s Cherry Protein Fluff at last month’s VIP Protein Pow Workshop. Check out the mesmerized look on Susie’s face as she eats her protein fluff. Now check out these guys, professional rugby players for Saracens. Or these guys from the Scottish Rugby Union. Look at their faces guys. These are professional athletes, taken in by the world of fluff. With protein fluff, the result is always the same: awe. People never just ‘like’ protein fluff. They LOVE it. And the reason is simple: because it’s like magic on a spoon. It straddles the border between marshmallow fluff and protein ice cream. It’s a cross between protein heaven and protein clouds. I know this all sounds ‘a bit’ ridiculous and if you’ve never tried protein fluff you’re probably thinking I’m one cheesy daughter of a gun but, please, don’t judge me or my fluff. Not until you’ve tried it. It’ll set your world ablaze! Below you’ll find my latest protein fluff recipe. I made it and devoured it post-workout this morning. You’ll find a lot more protein fluff recipes here as well as on the Protein Pow App. 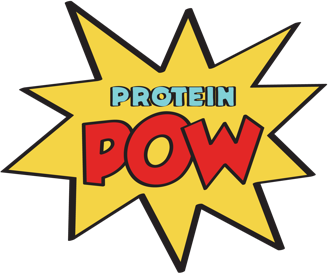 Also, bookmark this video – and subscribe to Protein Pow TV – in case you want a visual demo on how to go about best fluffing your pow. 1. Electrically blend your apples with your milk and whey until you get a sort of soft-servei-ice-cream texture: smooth and creamy. 2. Then, get out an electric whisker and whisk it for 3-5 minutes. You want to do this for a while so that you add in as much as air as possible, thereby ‘fluffing’ the mix. 3. Get out a spoon and demolish!!!!!! Variations with fluff are ENDLESS. You can use all kinds of fruits – as long as they’re frozen and any flavor of whey you want. You can also make whey with casein. The texture will be a bit different but it’ll still fluff beauuuutifully!